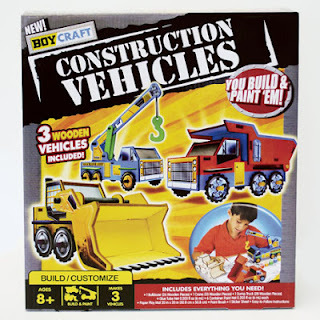 Flip Out Mama: Hot Gift: Boy Craft Construction Vehicles Kit! I have an artsy boy. That is no lie, he has always been obsessed with art, and "creating", since he was a baby. I love that about him. For Christmas, he is getting a desk, chair, and lamp to do his art projects in his room. He won't let me throw out boxes, or egg cartons, or anything like that, because he can use them for "a project". LOL That is one of my favorite things about him, is his love of arts and crafts. 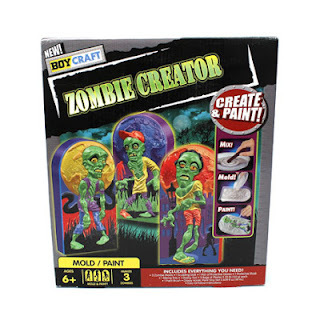 However, it is really hard to find crafty and art kits directed towards boys. Everything is pink and purple with glitter and sparkles... Not anymore! The new line of Boy Craft kits available from CraftProjectIdeas.com is just what we have been looking for! There are five current crafting kits, (with lots more in the works!) directed at boy crafters like my Tater! There is a Construction Vehicles Kit (which we received to review! ), a marshmallow shooter kit (on the Santa list now! ), Catapult Wars (already under the tree), and a Paint Your Own Dinosaur, and Rubber Band Launcher Kit as well. These are just what I have been looking for for my guy, and I am so glad there is a company that is taking note and making products for boy crafters like my Tater! I have to say that my favorite part of the Boy Craft kits is that everything that you need is included in one convenient package. No buying extras, and I love that! Tater was so excited to see a craft kit just for him! He said "WHERE DID YOU GET THIS!?!" The answer, Walmart! I love that I can get these at Walmart, and you know that means low prices too, so that is also great news! We want this new Zombie kit SO bad! These kits are great, I can't say enough good things about them! Tater and his dad have really enjoyed doing these crafts together for their special "no mom, no baby" time that they have! There were three vehicles included in this one, so Tater got to do two and dad, only one. ( Sorry, dad, get your own!) I really can't say enough good things about the folks at Craft Project Ideas for filling this niche in the market, and allowing boys to craft too! If you wanna check out some great gift ideas from Craft Project Ideas, click here! Don't forget all of the activity kits are available at your local Walmart, and include all of the pieces! Can't beat that!